MYSORE: On the lines of a miniature railway layout in Wunderland, Germany, tourists visiting Mysore will witness a mini-railway layout of the region. South Western Railway, Mysore division, has embarked on this novel project, a first-of-its-kind in the country, which is all set to be inaugurated in the first week of January. It will be a New Year’s gift to the people, especially train commuters. BB Verma, previous divisional railway manager, and proactive Anup Dayanand Sadhu, senior divisional commercial manager, are the brainchild behind this project, which will cost nearly Rs 13 lakh to Rs 14 lakh. Apart from the place, railways are not investing even single pie on the project. The project is taken up by Sriram Associates. Experts assigned with the project will create a Model Railway layout in which rail transport systems are modeled on a reduced scale. Scale models will include locomotives, rolling stock, tracks, signaling, tunnels, bridges, roads, buildings and features such as streams, trees and hillocks. Scaled human beings in different actions will also be shown. The scale adopted for Mysore city is HO scale (HO stand for half zero-a ratio of 1:87). The picturesque Coorg region is also included in the layout on an ‘N’ scale-a ratio of 1:160. All models on the railroad layout are “nearly realistic” making one to feel like they are witnessing real locations. Some of the spots exhibited on the layout are historically very important and they include the Mysore Palace, which will be illuminated during at night, KRS dam, Chamundi Hills, KR Circle, Clock Tower, Zoo and Mysore Railway station, to name a few, said Anup. Besides this, almost half a kilometer of railway track, bridges, tunnels, underpasses, nearly 3,000 trees will come alive in the model railroad layout. ‘Work on the models for the railroad layout is in its final stages and miniature scaled locomotives, passenger and freight coaches, track, signaling equipment and other components have all been imported from Germany and US, added Anup. The entire layout is lit with nearly 500 lead bulbs and will be in operation day and night. The 200 sqft model railroad layouts will be housed in the existing Heritage Gallery on Platform No: 1 at Mysore Railway station. The project which was taken up in June is all set to be completed by the end of this month. A railway enthusiast, Ramji, is creating this railroad model layout project. Important institutes like the All India Institute of Speech and Hearing, Manasagangotri, will also be seen on the layout. MYSORE: Sanamma, an octogenarian, from Singamaranahalli of Hunsur taluk, had confined herself to the village all these years. But September 23 seems to be a red-letter day in her life. On Wednesday, Sanamma, 80, was out on the city streets to witness Dasara celebrations and was awestruck by the beauty of Mysore Palace. “It looks like Kailasa (Paradise),” she said. Sanamma said though her place is 30 km from the city, she never had the opportunity to see its heritage beauty and the festivity of art and culture. Thanks to Dasara Darshan, a novel initiative by the government to introduce Dasara to rural folk, many people like Sanamma are able to witness the celebrations. As part of the festivities, villagers from five districts Mysore, Mandya, Hassan, Kodagu and Chamarajanagar are being facilitated to witness the celebrations. Besides, ferrying them to and fro from villages, the guests are also being taken for sight-seeing to Mysore Zoo, Chamundi Hills and Mysore Palace and also severed lunch. All this at Rs 50! This is the first time we are seeing the interiors of Mysore Palace, say Kendanna, 37, and Ramanayaka of Huyigowdanahalli of Hunsur taluk. “The beauty has really mesmerized us and we feel like coming again to see the Palace on our own,” they stated. Nagesh, 48, of Moogur village of T Narasipura taluk, is here with his wife, daughter and a relative. The family feels lucky to be here and is all praise for the government’s initiative. KSRTC divisional controller Srinivas told The Times of India that this is the second year and the response has been overwhelming. Starting September 20, over 3,000 villagers have seen Dasara and another 5,000 villagers will be benefited till September 25. “Arrangements have been made to create awareness among villagers about the programme,” he said. When the programme was introduced in 2008, it was restricted to only Mysore district. However, this year it is extended to five districts. “Plans are afoot to extend further in coming days,” Srinivas added. MYSORE: A nano-sized model of Mysore Railway Station, a heritage building, popular tourist spots in Mysore city, and tourist destinations of Mysore, Mandya and Kodagu districts, called the Model Railroad Layout, was inaugurated on platform 1 at Mysore station. It is modeled along the lines of Hamburg’s Miniature Wunderland, a first of its kind for Indian Railways. It introduces tourists to train routes and popular spots such as Mysore Palace, St Philomena’s Church, Chamundi Hills, Krishnaraja Sagar Dam, Mysore Zoo and Abbey Falls — all in miniature form. The model is created on 10 ft x15 ft space inside the Mysore Heritage Gallery, set up by the Railways at the station. There are working models of six trains in Mysore, Mandya and Kodagu districts; two of which are hauled by vintage steam locomotives running through tunnels and up hills, with half-a-dozen coaches in each train. Some items are handmade and others are imported. Bridges, tunnels, underpasses, everything is in place, as are nearly 2,000 trees. Swaminathan Ramji, an engineer who is now a metal and woodwork designer, created the model. Ramji, who owns a firm which creates models, is an avid traveller and rail enthusiast. He collected models from the US, UK and other European nations, and finally created his own masterpiece. It is made of metal, plaster of Paris, fibre, and some materials are imported, said Ramji. He has contributed at least Rs 6 lakh towards the project, which cost Rs 12 lakh. Dr Anup Dayanand Sadhu, senior divisional commercial manager, Mysore division, South Western Railway, said the miniature models of tunnels, Mysore Palace, KRS Dam, roads, bridges, houses, loading of iron ore at mines, an imaginary narrow gauge railway track in Kodagu district passing through hills and coffee estates, Coorg railway station and Sri Chamarajendra Zoological Gardens are almost real. A miniature Golden Chariot also runs on the track. And as in real railway stations, there are models of track, signal equipment, signal stations, petrol pumps, platforms, signal cabins and a parking lot. The miniature train starts from Mysore Railway Station and covers all the places in 10-15 minutes. The entire layout is lit with nearly 500 LED lights so it can be operated even during the night — everything from the whistle of a locomotive to the honk of a vehicle is digitally created. Former MP H Vishwanath inaugurated the model. He lauded Mysore railway division, and highlighted the contribution of Krishnaraja Wadiyar, who he said was instrumental in shaping Mysore and bringing the railway track to the city. BANGALORE: As temperatures in the plains are heading skywards, there’s only one place that people are heading to beat the heat – hills. But there’s a slight difference this time. While Ooty, Kodaikanal and Munnar are still hot favourites, their appeal has been declining with commercialisation and large crowds. Instead, travellers are exploring some of the state’s own nature destinations. “It looks like our hill stations are flavour of this season. Some of them are still unexplored and most of them do not have many tourists so people seem to be preferring them,” industry sources said. “Our campaign seems to be paying off. We have been advertising about the vast natural beauty and nature destinations that Karnataka has to offer. We have now also established fairly decent infrastructure in these places,” tourism commissioner Mahendra Jain said. According to industry sources, though high-end travellers prefer to go out of the country during the summer vacation, a host of other domestic travellers, especially from North India, choose to come down South. “But more and more of them are choosing Karnataka’s hill stations to Ooty and Kodaikanal,” sources add. For Bangaloreans, Nandi hills continues to be a favourite week-end destination, despite the bad facilities. For longer holidays, it’s either Kodagu and Chikmagalur are the preferred destinations, followed by the Western ghats. Both Kodagu and Chikmagalur district boast of thickly forested mountainous terrain and dense plantations, combining the aroma of coffee and spices. Kodagu is known for its misty hills and sudden fog which descends without a warning, while Chikmagalur is an explorer’s paradise, undiscovered by the hordes. However, the younger and more adventurous lot are choosing off beat destinations along the Western ghats. “They combine hill stations with adventure activity like trekking, mountain biking, rock climbing and rappelling. Camping out is catching on and many prefer to take this route rather than staying in a hotel,”said a tour organiser. These are Asia’s 22 greenest metropolises! Karachi, Pakistan’s largest city and commercial capital, generates a GDP per capita of $5,400. With an urban population of about 14.5 million, it is one of the world’s fastest-growing metropolises. In the index, it ranks well below average overall. Its best performance is in the water category, mainly for a low rate of per capita water consumption. Karachi has its biggest challenges in the transport and air quality categories. There are several projects underway to improve transport, sanitation, water and waste infrastructure. Of the 22 cities, Mumbai, is the densest city in the index with 27,000 people per square km – more than 27 times more tightly packed than Wuhan, which has less than 1,000 people per square kilometre. Mumbai, even though it has a fragmented energy delivery market which makes overarching conservation projects difficult formed the Mumbai Energy Alliance in September 2009. 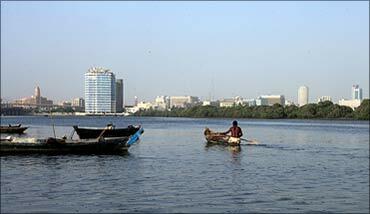 Mumbai is a burgeoning metropolis and India’s financial capital. With a population of about 12.7 million, it is the most densely populated city in the index. It generates a GDP per capita at about $2,200, which makes it one of the least prosperous cities in the Index. 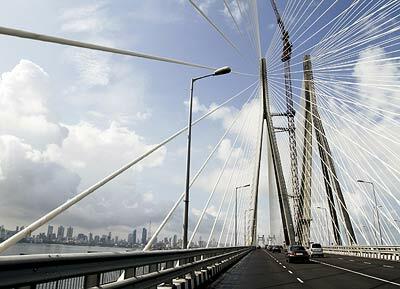 Mumbai ranks below average overall. Its best performances are in energy and CO2, land use and buildings, and water. The city has the second-lowest CO2 emissions per capita and benefits from a relatively high share of renewable energy for electricity production (21%). 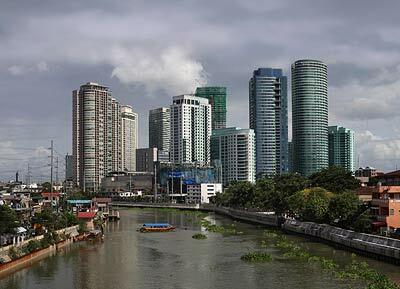 Manila is the Philippines’ capital, the largest city and political centre of the country. Metro Manila comprises 16 different cities and some 11.6 million people. The city has a per capita GDP of about $5,400. Manila ranks below average overall in the index, but its best performance is in the air quality category with low levels of air pollutants. Compared to the other cities in the low income range, Manila has the second-lowest rate of energy consumption per unit of GDP and per capita CO2 emissions that are well below average. Kolkata benefits from a relatively low level of water consumption, at 138 litres per person per day – this is one of the best rates among the 22 cities, and better than the average of 278 litres. The low rates might partly be explained, by a lack of supply. There is a variation in green spaces from 2 square metres per person in Kolkata, to 166 square metres per person in Guangzhou. Kolkata receives credit for having green standards for public building projects and for publicly promoting energy efficiency in buildings. 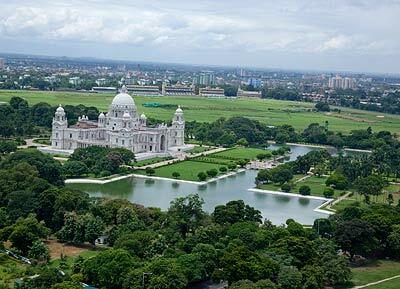 Kolkata’s metropolitan area is home to 15.6 million people, making it the fourth-most-populous city in the Index. 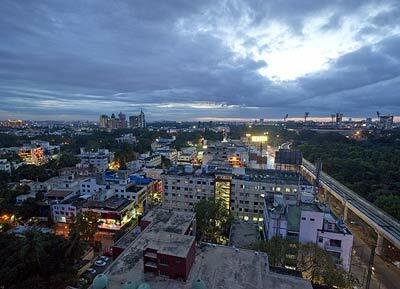 The capital of West Bengal is a regional hub for financial services and IT. Despite its growing economy, GDP per capita is the lowest among the 22 cities in the Index, at an estimated $1,400. Although its overall ranking is below average, it still has one of the lowest per capita water consumption rates. In addition, it has relatively low levels of CO2 emissions per person and low concentrations of sulphur dioxide. Hanoi, Vietnam’s 1,000-year-old capital city is home to 6.5 million people. Its economy, which has grown rapidly over the past decade, accounts for around 13% of Vietnam’s GDP. 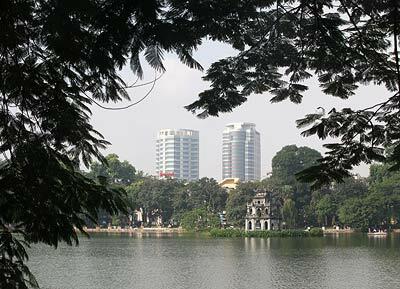 Hanoi ranks below average overall in the index. The city’s best results are in the energy and CO2, air quality, and waste categories. Particular strengths in these categories include relatively low estimated CO2 emissions, a high rate of electricity generated from hydropower, and efforts to set and monitor standards to combat air pollution. Bengaluru has some of the lowest levels of CO 2 emissions per capita — this is partially reflected in the fact that 30% of Bengaluru’s energy consumed comes from renewable energy and 61% of the electricity is generated from renewable sources, mainly hydropower. The city’s relatively low income, resulting in a less energy-intensive lifestyle, also plays a part in reducing CO 2 emissions, as does the shift from heavy industry to IT-related businesses. Bengaluru, with a population of 7.1 million, has developed rapidly in the past three decades to become a symbol of India’s high-tech competence. It is still one of the poorest cities in the Index with a per capita GDP of $2,066, and therefore has limited ability to balance environmental needs with the pressure for economic expansion. It ranks below average overall in the index. But its shift from manufacturing to IT-based industry has had positive effects on the environment and has also spurred the development of new, energy-efficient buildings. 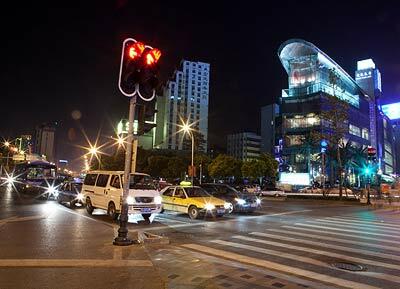 Wuhan, with a population of 8.4 million and a GDP per capita of $8,100, ranks average overall in the index. The city faces environmental challenges due to rapid growth and an economic base dominated by emissions-intensive industries. In 2007, the government designated Wuhan an experimental zone for sustainability policies. The city has now put greater emphasis on several environmental initiatives and on lower-carbon industries and services, suggesting that it can improve its overall environmental performance going forward. 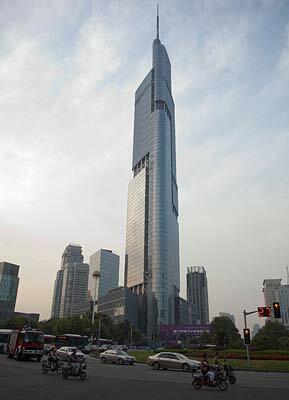 Shanghai, often referred to as China’s commercial and financial centre, has enjoyed strong economic growth over the past two decades. 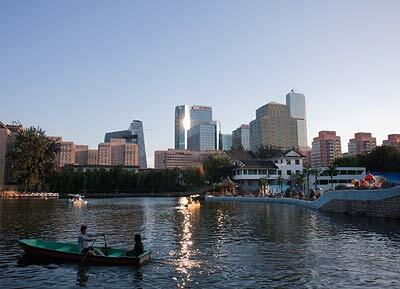 It is now among the richest cities in China, generating a GDP per capita of $11,500. 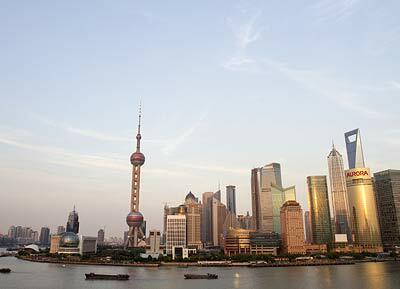 With 19.2 million inhabitants, Shanghai is the most populous city in the index. The city’s selection as the venue for World Expo 2010 was a sign of its growing international status. Shanghai ranks average overall in the Index, with strong clean air policies, the world’s longest metro network, but also very high CO2 emissions. Nanjing, with a population of 7.7million, is a major manufacturing base with special focus on chemical and car production, but also a growing service economy. Although the city boasts the largest inland port in China, it generates a GDP per capita of only $7,300 and therefore falls into the low-income range. Nanjing ranks average overall in the index, but stands out in some aspects — especially in the water category, where it benefits from low levels of water leakage and robust policies on water quality and sustainability. 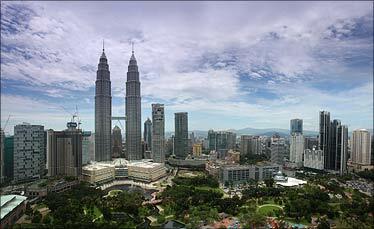 Kuala Lumpur is the capital of Malaysia and the country’s business and financial centre. The city is relatively prosperous with a GDP per capita of $12,400 and ranks average overall in the index. Transport and air quality are Kuala Lumpur’s strongest categories. Proactive transport policies, along with a relatively extensive and advanced rapid transit network are paying off. Although vehicle traffic is still heavy in the city, Kuala Lumpur has the second-lowest level of sulphur dioxide emissions in the index. 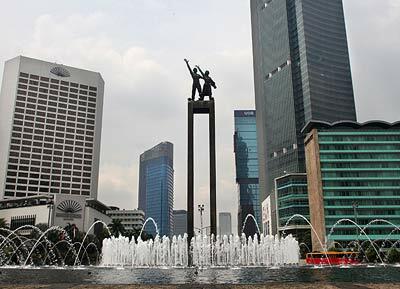 Jakarta is ranked average overall in the Index. Indonesia’s capital is the country’s largest city, with a population of 9.2 million. With a GDP per person of $7,600, it is the richest city in Indonesia, but is still among the lower income cities in the index. Jakarta scores best in the energy and CO2 category, mainly for its low levels of CO2 emissions and energy consumption. The city has shown leadership by pledging to reduce carbon emissions by 30% by 2020, going beyond the national target. 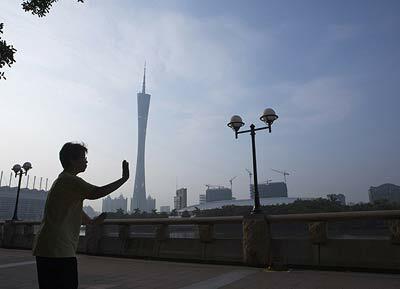 Guangzhou, with a population of nearly 8 million and a GDP per capita of $16,800, ranks average overall in the Index. Its best performance is in the sanitation category, driven by robust sanitation standards and strong policies on monitoring. The city also excels for the most green spaces per capita. Since 2008, Guangzhou has been at the centre of an ambitious infrastructure investment programme to promote economic integration in the Pearl River Delta. The government has also completed a number of major public transport projects. New Delhi has an extraordinarily low per capita waste generation figure of 147 kg per year — Delhi’s ‘traditional culture of careful consumption’, which economic growth has not yet eroded, helps explain. The city’s advanced policies, including one of the more robust strategies to reduce, re-use and recycle waste, also demonstrate how much can be achieved with limited resources. 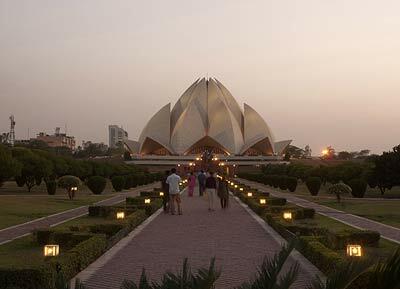 New Delhi, with some 17.4 million inhabitants, is the third most populous city in the Index and the second economical centre of India. Its average per capita income of $2,000 is more than twice the national average, but the city is still among the poorest in the Index. Delhi ranks average overall, but excels for one of the lowest levels of CO2 emissions in the Index and for generating the least amount of waste per capita of all 22 cities. Delhi hosted the Commonwealth Games in 2010, which spurred city officials to embrace green policies. Beijing, China’s capital city with some 17.6 million inhabitants, is a sprawling commercial hub, generating a GDP of just about $10,000 per capita. Beijing is trying to balance its growth ambitions with a stated desire to protect the environment and ranks average overall. To prepare for the 2008 Olympic Games, the national and city governments invested heavily in improving air quality, landscaping and transport. The city still faces significant environmental challenges, especially in the area of greenhouse gases. Bangkok, with an average overall ranking in the Index, is Thailand’s regional commercial and transportation hub and home to 5.7 million people. 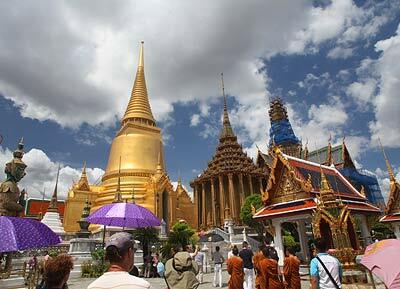 Its services-dominated economy accounts for nearly 30% of Thailand’s GDP. To deal with the environmental challenges caused by a growing population, Bangkok has implemented various measures such as a dedicated global warming action plan. With its particular progress in vehicle emissions standards, the city’s best performance is in the areas of environmental governance and air quality. 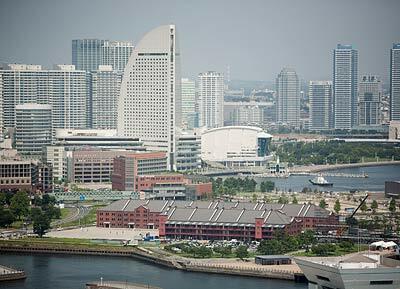 Yokohama, with a population of 3.7 million, is one of the richest cities in the Index with a GDP per capita of $30,200. The city ranks above average overall in the index and does consistently well across all categories, with a ranking well above average in the water category. In 2008, the city was named one of six “environmental model cities” in Japan. Officials have set targets to reduce the city’s greenhouse gas emissions by 30% by 2025 and 60% by 2050, and have also targeted waste reduction as a key environmental priority.